While the water crisis unfolding in Flint is perhaps the most egregious example of austerity in recent memory, it is part of a larger emergency developing nationally. 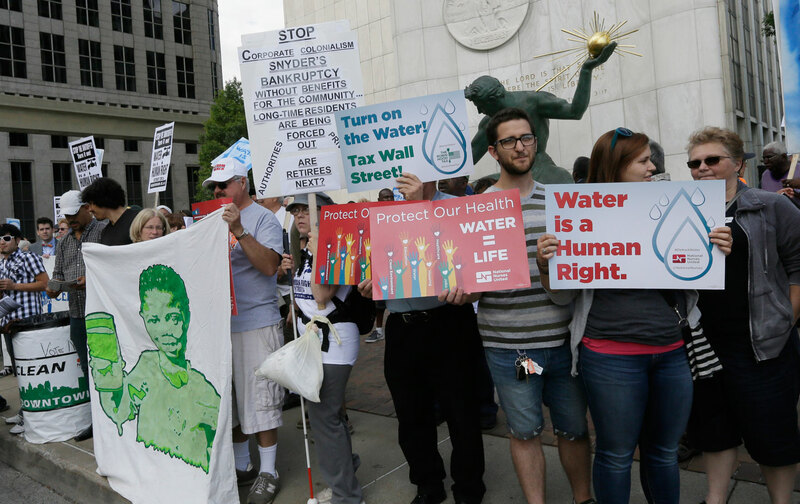 In 2014, Detroit became the first major American city to enact mass water shutoffs, with 46,000 poor households receiving disconnection notices that May. And in Pittsburgh, Baltimore, and other cities, consumers face steep price increases in their water bills. These shutoffs and rate hikes can be traced back to one common source: Wall Street. Baltimore is one of the most visible examples of how dangerous financial deals with Wall Street can push a city over the edge into crisis. In April 2015, just days after Baltimore began shutting off water to households that were behind on their bills, Freddie Gray died from injuries sustained while he was in police custody. This set up a bitter irony: As activists drew attention to the routine dehumanization of black and brown bodies by law enforcement, the majority of shutoff notices went to homes in predominately black neighborhoods. By May 15, 1,600 homes had lost their water. But what Chow failed to disclose is that responsibility for this debt does not entirely lie with residents. In fact, Baltimore has given away much more than $40 million to Wall Street to pay for toxic interest rate swaps. These toxic swaps are complex financial instruments that banks pitch to government entities—often without proper explanation of the risks involved—as a way to save money on infrastructure projects. And so, facing both crumbling infrastructure and falling revenues (due in part to declining federal support for infrastructure projects), many water department officials signed on. Baltimore punished vulnerable residents for a crisis they did not cause. But in 2008, when Wall Street crashed the economy, and the massive risks associated with these deals came to light, cities across the country found themselves owing banks millions of dollars. And because of termination clauses written into the contracts, local governments could not get out of the disastrous deals without paying high penalties to the very institutions that caused the crisis. Baltimore had used toxic swaps in conjunction with auction rate securities, a type of very risky variable-rate bond. So, by the summer of 2015, Baltimore had paid banks nearly $56 million in interest payments just for water and wastewater swaps, and another $43 million in penalties. The grand total for all the city’s swaps, not including the huge losses on the city’s auction rate securities, came to nearly $200 million. Even though only about $15 million of the $40 million in delinquent water bills was attributable to residential accounts, Baltimore shut off water to more than 3,000 residences, many of whom were among the poorest in the area. In contrast, by mid-July, only two businesses had experienced shutoffs. And so, in adopting the traditional austerity rhetoric of “paying their fair share” and “shared sacrifice,” Baltimore punished vulnerable residents for a crisis they did not cause, leaving wealthy corporations unscathed and even free to profit anew. A year earlier, in 2014, Detroit began large-scale water shutoffs as the city’s bankruptcy case was working its way through court. As with Baltimore, interest rate swaps were a contributing factor in Detroit’s financial crisis and to the struggles of the Detroit Water and Sewage Department (DWSD) in particular. After years of hefty payments on its swaps, DWSD ultimately had to borrow $537 million to pay banks in 2012 when expensive termination penalties in its water swap contracts were triggered. In addition, Detroit water customers have seen their rates spike by nearly 120 percent in the last decade; almost half of their payments now go toward paying down the debt on the swap termination fees. In a city where nearly 40 percent of residents live below the poverty line, it’s not surprising that many have fallen behind on their skyrocketing bills. In the austerity game, there are clear winners and losers. Because the DWSD borrowed money for the termination fees, ratepayers’ money is going not only toward the banks’ payday, but also for interest to bondholders on the debt. There are other cities where the water crisis is playing out less visibly. For example, in 2007 and 2008, as Pittsburgh faced aging and leaking infrastructure, banks pitched Pittsburgh Water and Sewer Authority (PWSA) a deal pairing variable-rate bonds with swaps. But, as was the case with other municipalities, these deals seemed to go wrong almost immediately. Between 2007 and 2014, PWSA paid nearly $113 million in net interest payments and termination fees on the swaps. By the end of 2014, it faced an additional $87 million in bank penalties to get out of the deals. These swaps continue to drain resources from PWSA. Facing $780 million in debt, PWSA became a good target for austerity crusaders and privatizers who promise savings and “efficiency” to desperate city officials. Enter Veolia, a multinational corporation that secured a lucrative three-year management contract with PWSA in 2012. In a city where nearly 40 percent of residents live below the poverty line, it’s not surprising that many have fallen behind on their skyrocketing bills. This problem is not limited to these three cities. Water departments across the country, desperate to raise money to replace and repair deteriorating infrastructure, got entangled in highly risky deals that they did not completely understand. Now they’re stuck diverting resources from infrastructure improvements to bank payments and remain vulnerable to predatory companies dangling well-worn promises of cost savings. Ultimately, this trend is not just about water. These examples are part and parcel of a cycle of destruction that is a key feature of “modern disaster capitalism.” This occurs when banks and other large corporations use their political clout to cut taxes, leading to big reductions in the revenue necessary to sustain vital infrastructure of all kinds. Elected officials and city staffs must then struggle to find ways to fund projects, becoming easily exploited customers for Wall Street’s risky and opaque financial deals. And when the deals fail and those responsible have their payday, there’s always another profiteering company ready with more promises of “cost savings” and “efficiencies.” The most vulnerable among us pay the highest price for their profits. Carrie SloanCarrie Sloan is the Senior Research Analyst at the Refund America Project.